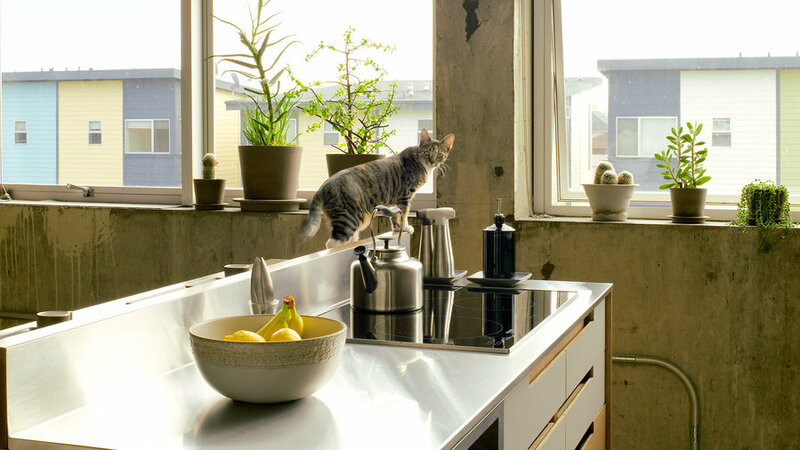 "The old kitchen was lacking in the charm department, for sure," Christina Zamora says of what came with this live-work loft in West Oakland, in a former elementary school from the 1920's. After a clever and functional remodel, the kitchen for two artists (Christina is a designer at Heath Ceramics in Sausalito and her partner, Cathy Lo, works as an art director in San Francisco) has charm to spare. Collaborating with designer Jon Norton, the couple came up with a layout that worked for their creative lifestyle: the key addition being a new island. 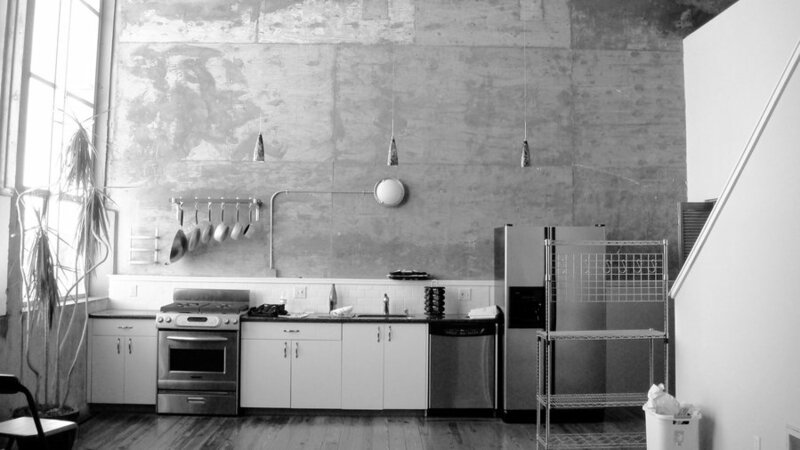 "The island isn't a barrier between the kitchen and the studio--it's just a part of the studio," says Christina. 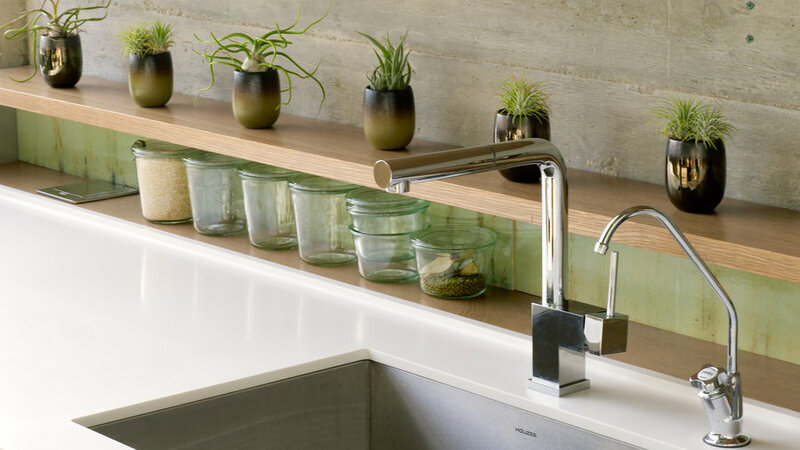 "We wanted the kitchen to feel really integrated into the space," says Christina. The design does this in subtle ways: The concrete wall doubles as a backsplash; the new island "floats" in the open loft; and the color of the island's white oak echoes the warm pine floorboards. On the couple's new island, a slab of white oak serves as the breakfast bar; on the far side, a sleek induction stove is set in a stainless steel surround. The drawers below the cooktop have cutout handles instead of pulls to let air cool the hot surface. The "wood" panels on the front of the island are actually recycled ceramic kiln shelves that Heath offers as part of its tile collection. 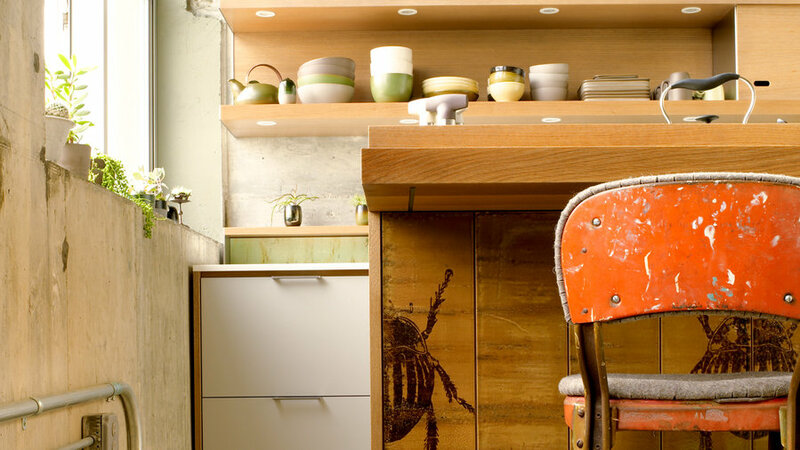 Christina cut the shelves to resemble pieces of lumber, then screen-printed beetles and lettering on them. The couple used reverse psychology when planning for their cabinets. 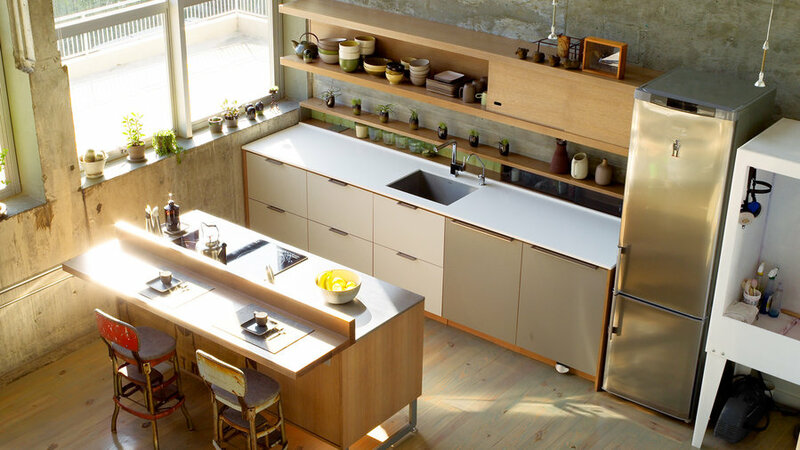 "Having closed cabinets would only give me permission to accumulate more objects!" says Christina. Roomy cabinets hide appliances, while tea and coffee provisions are stored in a long, narrow built-in above the counter. Heath seconds sit atop the slender case. The wall makes a dramatic (18 feet high!) backdrop. 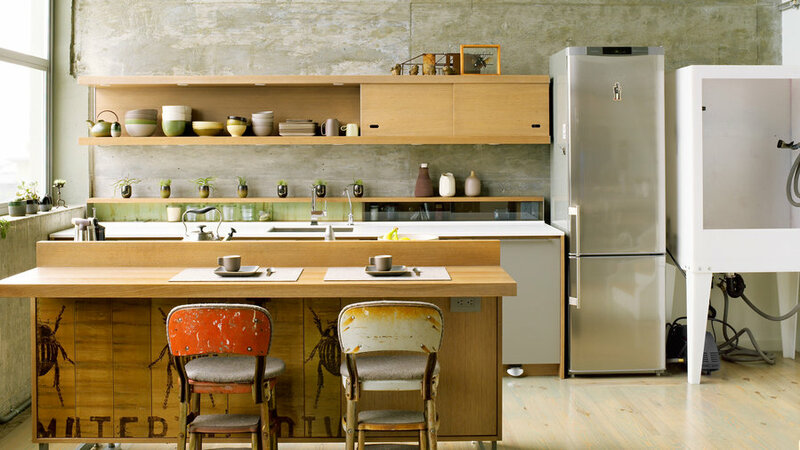 The concrete's raw color and texture are echoed by the vintage Cosco barstools. Sitting atop the narrow shelf above the sink, imperfect teacups make good holders for air plants.